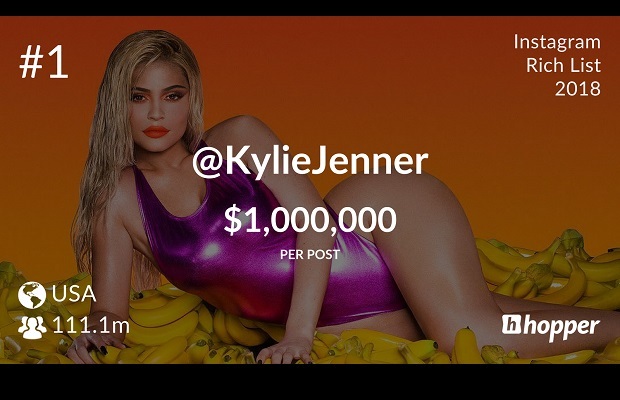 Reality TV star Kylie Jenner has been named the highest earner on an Instagram rich list, estimated to make $1m (£760,000) per sponsored post. Instagram scheduler HopperHQ has compiled its 2018 Instagram rich list which tells you who is making how much with each post and who is leading the charts on the social media app. HopperHQ is an Instagram planning and scheduling tool that analyzes internal and publicly available data to calculate how much celebrities and influencers can charge for a post on the social media platform. Its calculations factor in average engagement, how often a user posts, and their number of followers. However, marketers tend to be secrerive about how much they pay, or the posts may be part of a wider deal - as is often the case with A-list celebrities or sports stars - so the exact amounts are not known.